With the growing interest in visiting the city's differently themed parks, the Forbidden City received 114,800 visitors on Wednesday, the second highest number ever since the Golden Week holiday system came into operation. On May 2, more and more people flocked to parks and suburban scenic spots for travel. Among all the tourist attractions, the Forbidden City in Beijing was the most packed at 2.3 times its capacity, receiving a total of 114,800 visitors. This was second only to its record high in 2000, according to the latest statistics from the Beijing Holiday Office yesterday afternoon. 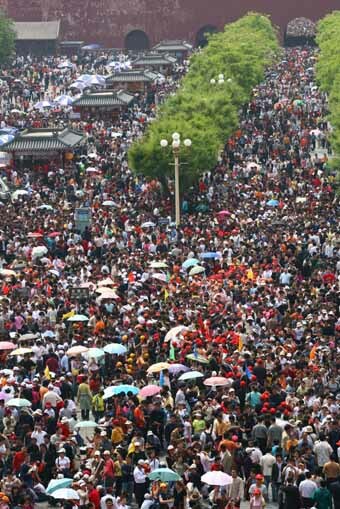 The Long Qing Gorge in Beijing's countryside attracted 15,000 visitors, also surpassing its maximum capacity. Other over-packed tourist destinations in Beijing included the Badaling Great Wall, the Summer Palace, Beijing Zoo, the Tian' an Men Square, the Beijing Aquatic Museum, the Shijingshan Amusement Park and the Happy Valley. In addition, the ongoing pop music week in Chaoyang Park, in east Beijing' s Chaoyang District, stands out as a cultural campaign for city branding. The event put on 13 performances on Wednesday morning, attracting over 61,000 visitors from both home and abroad. The Beijing News reports that 67% of the star-leveled hotels in Beijing have been rented out in the past few days with the average hotel rent ratio hitting 73% in the city and 49% in the countryside.